Livestock have been playing an important role in the farm economy of mountain households. Table 3.1 shows that livestock alone contribute 47.3 per cent and 35.7 per cent of the total agricultural income in the mountains and hills respectively. Figures within parentheses indicate percentage contribution. Similarly, a case study in the Western Himalayas (Himachal Pradesh) shows that livestock contributes 25-26 per cent of the total farm income per household (HH). Smallholder dairy farming is becoming increasingly popular in many of the accessible pocket areas of the HKH. It has also been the driving force behind the transformation of the rural economy in many parts of the Nepalese and Indian hills. An established market for fresh milk and the development of milk cooperatives and milk collection centres have made this possible. While the development of smallholder dairy farming in Nepal's hills was achieved by replacing low-yielding cattle with high-yielding buffaloes (murras, or murrah cross-breeds); development in the Indian Himalayas, and particularly the Western Indian Himalayas, came about through the replacement of local cattle with improved cattle (Jersey or Jersey cross-breeds). Smallholder dairy farming in both Nepal and the Indian Himalayas is discussed in greater detail below. Waiting by the road with milk for collection. In Nepal's hills, areas that are accessible via the road network have experienced significant growth in smallholder dairy farming. The marketing of milk has been facilitated by the establishment of milk collection centres that transport milk to the main chilling centres established by parastatal government organizations, as well as by private dairies, in the main towns or cities. The government has established chilling centres that are the ultimate market for the milk sold by the smallholder. Smallholders manage their herds in order to maintain a steady supply of milk. The number of milch animals that can be reared in a smallholder system has a certain ceiling. The obvious determining factors to this are the size of landholding, the availability of feed, and human labour. There was general consensus among the farmers interviewed that the optimal number of milch buffaloes that can be maintained under the prevailing conditions for smallholders rarely exceeds three animals. Most farmers interviewed owned between one to two milch buffaloes. Given the limitation of the herd size for milch animals, the main problem is ensuring a continuous supply of milk when one or more of the animals in the herd is not lactating. Innovative farmers have adapted to the changing circumstances. Box 3.1 illustrates one strategy adopted by a smallholder dairy farmer. A farmer buys a milch buffalo from a lowland buffalo trader at a price of Rs 23,000-28,000. The animal is milked for eight months to a year and the gross income amounts to Rs 25,000-30,000. Some farmers sell expectant ` bakerno' buffaloes for Rs 18,000-20,000 after one year of milking and buy an in-milk buffalo `laino' from the trader at a price of Rs 25,000-30,000. This is to ensure continued milk production. If the farmer waits for the `bakerno' buffalo, it takes about eight months before it calves and begins producing milk. The strategy is most suitable for smallholders who manage only one buffalo, but it is also being adopted by those who have more than one buffalo. In circumstances when old buffaloes become `tharo' (dry) , they are sold for meat for about Rs 8,000-10,000, depending on body weight. Similarly, in cases in which animals do not conceive for ten years, they are sold for meat, generating a salvation value of Rs 4,000-6,000. The majority of smallholders do not raise buffalo calves to maturity. The calves have a poor survival rate and are deliberately starved. Buffalo calves, if raised, consume three to four litres of milk each day for at least three months, and therefore reduce the amount of milk that can be sold in the market. They are also difficult to maintain after the weaning period because of feed resource constraints. In most cases, the buffalo provides milk from the third day after calving. The process is made easier by an injection that hastens lactation.Farmers prefer lactating buffaloes without calves. Table 3.3 shows that most of the milk production in Nepal is from buffaloes. The share of buffalo milk and cow's milk in the total milk produced 1996/1997 was 69.4 per cent and 30.6 per cent respectively, showing that buffaloes are the main milk producers. The high yield of buffalo milk suggests a high proportion of of improved buffaloes, especially in accessible areas. The preference for buffaloes for milk production has led to a great demand for the high-yielding murrah breed. The main reasons for this are identified in Table 3.4. Produce more milk than local cows and with a higher fat content (1.4% higher). Fetches a higher price per litre. High salvage value. Tired buffaloes and male buffaloes sell for as much as Rs 8 000 per head at the farm gate. Well-adapted to local feed sources. Performs well on poor quality roughage and agricultural residue (feeds even on millet stover, unlike cows). Improved buffaloes, in general, are comparatively more resistant to prevailing diseases than exotic breeds of cattle. Gives more manure than cows. Two buffaloes give enough manure for 4-5 ropani (0.25 ha) of land. Irrigation and cultivation of quality fodder not a prerequisite as it is for improved cattle rearing. Local cows produce less milk with less fat. Milk sells for a lower price per litre. No salvage value for cows or bulls. Improved cows require quality fodder (legumes) and higher amounts of concentrates for an economically viable performance. Improved cows are more vulnerable to diseases and cannot be sustained without veterinary support services. This preference for buffaloes has led to a burgeoning business for buffalo traders. The buffaloes are brought from the Indian border areas in the lowlands and sold for a modest profit through various centres in the country. Box 3.2 describes one case of a buffalo trader in Pokhara. An important factor driving this trade is the fact that farmers in the hills prefer buying buffaloes that are already lactating rather than raising the calves to maturity. Raising calves to the lactating stage is a challenge for the smallholder in the hills for several reasons. First, increasing scarcity of fodder and grass in the high pressure hills means that a farmer cannot afford to maintain and raise the calves through their unproductive phase. Secondly, in the colder climate of the hills the gap between lactations is very long and disrupts the continuous supply of milk. Buffaloes conceive much easier in the warmer climate of the lowlands, making the present trade in buffaloes from the lowlands to the hills possible. Buffalo dealers have been arriving in Pokhara, for the past 15 years, bringing in cross murrah. Each year, 200-300 buffalos are sold in the area. The point of purchase is Sitamadi, a village in Kannadmudia near Raxaul, where farmers rear female calves to maturity and a farmer sells 2-3 buffaloes. Buffaloes are walked up to Raxaul from Sitamudi. From Raxaul, they are transported to the point of sale (Pokhara) in trucks with the capacity to carry seven buffaloes at a time. The transportation cost is Rs 12,000 per trip. Ten years ago, a trader used to make two trips a month, bringing a total of 14 buffaloes. Nowadays, he makes four trips a month bringing a total of 28 buffaloes per month. The trade within the last decade has nearly doubled. The new buffaloes, once they arrive in Pokhara, are hand-fed for two weeks. Such feeding is necessary because the quality of feed available locally in Nepal is poorer (perceived as such by the trader) than that which the buffaloes are fed at their point of origin. They get used to the local feed after two weeks. The price structure of the buffaloes when sold is directly related to the amount of milk they produce: the greater the milk production, the higher the price. The traders indicated that their monthly profit margin was about Rs 10, 000 per trip. This translates to a margin of Rs 200 per buffalo. Trading buffaloes in this manner is a typical case of the upland-lowland interactions prevailing in the HKH. In this particular case, the lowland farmers specialise only in breeding and supplying lactating buffaloes, and the upland farmers do not breed the animals but purchase the buffaloes in order to maintain an uninterrupted supply of milk (Box 3.1). Examples from Dolakha, a high mountain district in Nepal, further illustrate the spatial distribution of livestock. 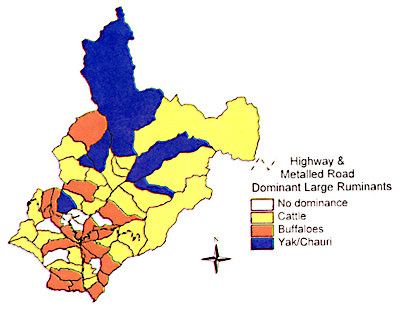 The map shows a spatial distribution pattern of buffaloes and cattle in Dolakha District (Map 3.1). The concentration of buffaloes closely follows the road network, unlike the concentration of cattle (local) which is quite random. In accessible areas, there is an obvious incentive to keep high-yielding buffaloes. Smallholder dairy farm animals produce raw milk, some of which is kept for household consumption and some of which is sold in the market. Usually, the morning milk is sold to the milk collection centres or local teashops and to sweet shops and private dairies (in urban areas). Generally, the evening milk is kept for home consumption. The milk for home consumption goes to make mohi (buttermilk), ghee (clarified butter), and milk for drinking. Home consumption is important from the perspective of household nutrition. Smallholder dairy households do not necessarily compromise the nutrition of the family and its children by selling all the milk. The milk flow chain for the marketed component of milk is shown in Figure 3.1. Milk is hand-carried to the local collection centre, usually located in a teashop. Generally, these collection centres are cooperative/producer association establishments. From the collection centre, the milk goes to the local chilling centre, usually carried on the back in 20-60 litre milk cans by hired porters, often over long distances (see Annex 4). From the local chilling centre, milk is moved to the regional DDC chilling centres via road transport (Box 3.3). The marketing of milk has been facilitated by the establishment of collection centres that transport milk to the main chilling centre in Pokhara as well to private dairies. The chilling centre of the Dairy Development Cooperation (DDC) in Pokhara collects milk from 5 districts (Gorkha, Syangjha, Kaski, Tanahu and Parbat) involving approximately 7,000 farmers. It supplies pasteurised milk to urban consumers in Pokhara, Syangjha, and Gorkha. The average supply from an individual farm household amounts to 2 litres per day. The average production varies with the peak and lean seasons. During peak season, the total production reaches 15,000-16,000 litres a day, whereas during lean season, it amounts to 5,000 litres a day. Buffalo milk fetches a higher price than cow's milk due to the higher fat content. The average price paid for buffalo milk is Rs 14.32 per litre, compared to Rs.11.72 a litre for cow's milk. The cost per litre takes into account both the fat and the SNF (Solid Not Fat) content which varies between the peak and normal seasons. The price for fat is Rs 1.30 per litre in the peak season, and Rs 1.34 in the dry season. The higher price in the dry season is used as an incentive. The supply to private dairies is from the local collection centres. From these two channels, milk from smallholdings goes to the urban consumers in the form of pasteurised milk and value-added products such as ice cream, yoghurt, and butter. About 100,000 farm families supply milk to urban consumers in this way in Nepal. Inaccessibility in the mountains is the main constraint to the successful transfer of milk from the smallholdings to the processing centres. Milk, being a perishable commodity, needs to reach the chilling centres in time to maintain quality. Chilling facilities are thinly spread and therefore necessitate long walks for the milk-carriers, putting the quality of the milk at risk. Apart from outlets to government-owned chilling centres, smallholder dairy farmers also supply milk to private dairies in the area. Small-scale private dairies have also started tapping the supply of milk from smallholdings by setting up their own collection centres, and by offering slightly higher price incentives to farmers. Private sector involvement in processing milk from smallholdings is increasing. In Nepal, there are more than 20 private milk processors operating. However, private processing enterprises still face several constraints that impede their growth. The difficulties faced are mainly in the area of skill development in dairy processing. Public sector expertise in milk processing has not been transferred adequately to private entrepreneurs, and widespread training is essential. The private sector's efforts are also uncoordinated, and quality enforcement is lacking. The private sector also suffers from unfair competition with the subsidised public sector. These problems are specific to Nepal where there is relatively more involvement of the private sector in the milk industry than in the Indian Himalayan States. Box 3.4 below describes the case of a private dairy in Pokhara. An entrepreneur initially invested a total amount of NRs. 2.5-2.6 million to start his dairy business four years ago. Most of the milk is delivered from Syangjha by farmers. Fifty-five per cent of the milk generated comes from buffaloes and 45 per cent from cows. Some of the by-products of milk that he has managed to sell are ice-cream, butter, ghee, and yogurt. He has two showrooms and one factory with a total rental cost of Rs 25,000 per month. His ice-cream sells for Rs 25, which is Rs 10 less than the competing brand. To meet the demand for milk, he imports 20 quintals of milk powder per year, equivalent to 22,000 litres of raw milk from dairy animals. The entrepreneur states that there are fewer farmers who come to sell milk despite the higher price paid per litre -10 per cent higher than regular dairies. He compares the cost of a litre of milk to a bottle of mineral water, both of which cost Rs14-15 per litre. He is concerned about the government's inappropriate pricing policy which benefits urban consumers. He pointed out that incentives have to be provided at all levels to make the dairy business a worthwhile one for private entrepreneurs. The high cost of feed, high interest rates, and difficult labour management are constraints to this entrepreneur's business. In the Indian Himalayas, the development of the road network has greatly facilitated the development of the dairy industry. In the hill state of Himachal Pradesh, Himachal Pradesh Milk Producers Federation (HP Milkfed) undertakes marketing of milk in the state. Private milk vendors operate only in areas surrounding towns and cities. HP Milkfed is running nine milk supply schemes in eight districts of the state, and it has three milk plants and 31 chilling centres. Milk marketing is supported by a state run corporation, the Milk Federation, and a network of milk plants and chilling centres collecting milk from cooperatives and farmers. Box 3.5 provides details of plant operation in Mandi District. In Mandi District, the main milk plant at Chakkar near Mandi town is supported by five 2,000-litre chilling centres with their milk collection routes located in the main milk production areas of Mandi District and also by four other chilling centres in a neighbouring district. The milk plant collects an average of 7,000 litres of fresh milk per day and supplies pasteurised milk in bags to urban markets in Mandi and Kullu, as well as processing milk products such as butter, ghee, paneer (curd cake) and ice-cream. Some excess milk (about 10% of the milk collected) is sold to plants in Shimla and in the Punjab during the peak summer collection months. Eleven collection routes are operated in Mandi District, with about 7,000 registered cooperative members. The Milk Federation also supplies some inputs to cooperative members, including fodder mini-kits and subsidised compound concentrate feeds. The marketing service has been a major factor in the development of more intensive milk production in the state. There is some demand by farmers for the collection routes to be extended, although the milk plants currently collect enough milk to satisfy local urban demand for liquid milk and do not have plans to expand. Although the cooperative milk marketing infrastructure is ridden with problems in many areas of the state, there is no alternative other than cooperatives for providing a milk outlet in areas outside towns and cities. Live animals and livestock products are marketed mainly through private trading channels. Live animal markets are held regularly in the main centres and in seasonal markets, moving from the lowlands to the higher valleys in the summer. Milk sales by households located away from the road are nil. In Kullu District, one 2,000-litre capacity chilling plant exists at Mohol near Kullu town. This plant supports three main collection routes covering 200 km in the Kullu and nearby valleys, collecting up to 900 litres of milk a day in the summer. The plant supplies liquid milk to the hotel and urban markets in the Kullu Valley (there is no packaging facility). Excess milk is sent to the Mandi milk plant. An interesting difference between the Nepal hills and HP is that, in Nepal, private dairies have their own collection centres and processing units. In HP, it is all handled by the public sector. There is a considerable deficit in milk supply in major towns, e.g., Shimla, where it is believed that 40-50 per cent of the milk supply comes from the lowland states of Punjab and Haryana. In Himachal Pradesh, the number of improved animal breeds has increased with the development of the dairy sector. Proximity to the artificial insemination facility led to an improvement in the stock of animals through the replacement of indigenous cows with cross-bred cows. The provision for the sale of milk and the scope to earn cash income played a strong role in reducing livestock pressure, thereby improving the quality of the herd and reducing the high number of animals that are considered harmful to the ecology (Chand 1997). Figure 3.2 indicates that the share of quality animals such as cross-bred cows and improved buffaloes increased during the period from 1982-1992 in HP. The increase in milch buffaloes and milch cow cross-breds was 6.3 and 13.2 per cent respectively between 1982 and 1992. In HP, the cross-bred cattle population is highest in Kangra, followed by Shimla and Mandi. This pattern closely corresponds with the distribution of Veterinary Hospitals and Dispensaries (VHD). Kangra has the highest number of VHDs, followed by Shimla and Mandi. 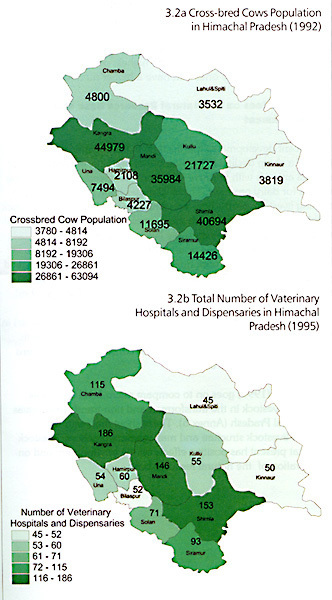 Map 3.2 shows the spatial distribution of the cross-bred cattle population and the distribution of veterinary services in Himachal Pradesh. Availability of veterinary services is an important factor in the adoption of improved breeds. Improved breeds cannot be sustained without adequate livestock support services. Hence, the districts with the highest populations of cross-bred cattle are also the ones that have a higher number of VHDs. Recent developments (particularly in transformed areas) include a sharp decline in the number of animals, the replacement of local animals with improved livestock, stall feeding, and a better market for dairy products. These changes have all contributed to making livestock production economically viable. Rearing livestock in this way is compatible with the natural resource base of the local area, and it makes it a sustainable livelihood option. In comparison, farmers in the non-transformed areas keep a high livestock population of poor quality and graze their animals instead of stall feeding them. This results not only in low production, but also in degradation of pastures and grazing lands (Sharma 1996). A case of two Panchayat(s) (village-level administrative units) in Himachal Pradesh presented in Box 3.6 illustrates differences in livestock management practices and the consequent implications for the natural resource base. Sharma (1996) goes on to compare micro-level indicators related to livestock in the transformed and non-transformed areas in Himachal Pradesh (Annex 7). These show that, with the changed livestock structure and management practices, livestock raising at present has positive effects on the environment and on conservation of the natural resource base. Dependence on animal husbandry is high in the panchayat, where income from crop production is low and scope for the sale of milk does not exist,. However, the resources and incentive to keep better quality animals are lacking. Farmers in this panchayat keep animals able to thrive on biomass from common land or on home-produced crop residues. Since such animals are low-yielding, farmers tend to keep more. This makes stall feeding a larger number of animals difficult. Therefore, the owners resort to grazing the animals and increase the grazing duration. In panchayat(s) where dependency on livestock is low due to a higher income from vegetable cultivation or because a sales' outlet for milk is available, farmers maintain fewer but higher quality animals, giving them better nutrition and thereby obtaining a higher milk output than in a panchayat with a poorer breed of animals. Good quality animals are taken less for grazing, since grazing results in a reduction in milk yield due to a loss of energy during movement on hill slopes.